What’s a typical day like on the river? Is there a tight schedule? These and other questions may be common for you as you approach your first whitewater rafting trip. 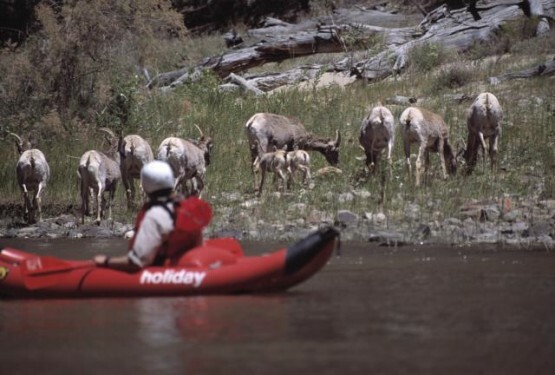 Rest assured, your experienced rafting guides from Holiday River Expeditions have a strong sense of appropriate cadence to ensure a trip that is enjoyable as it is unique. Each adventure takes on its own attitude, but it is nice to be able to count on certain elements of your day. You may awake to the song of the canyon wren, the sound of boiling Cowboy Coffee, or just the desert sunshine. Chances are your guides are already awake, pumping boats, and preparing the first (and most important?) meal of the day. From cinnamon rolls to our world-famous Big Drop Omelettes, yogurt to cereal, our crew makes sure you are well-fed. After striking camp, watch Holiday’s ruthlessly efficient guides fly into a packing frenzy. 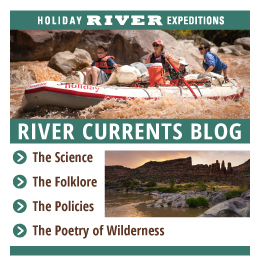 When the cam straps and dust have settled, your float vessel is doubtlessly ‘RTF’ (rigged to flip, if on a rapid day) with an impressive array of dry bags and sleeping pads (ask your guide about the ‘Cleopatra Seat.’) Once everything and everyone is ready to go, there may be a whitewater safety talk followed by river miles through scenic sandstone cliffs. Arguably one of the biggest highlights of anybody’s trips. Some guides say there are two types of fun; Type 1 is fun now and fun later, while Type II is not fun now, but fun later to reminisce about. 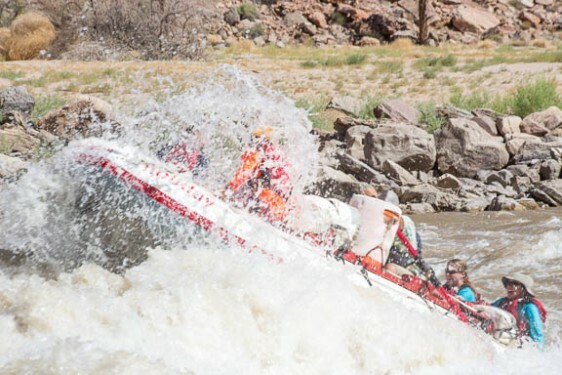 Which type do you think this raging Colorado River whitewater is? 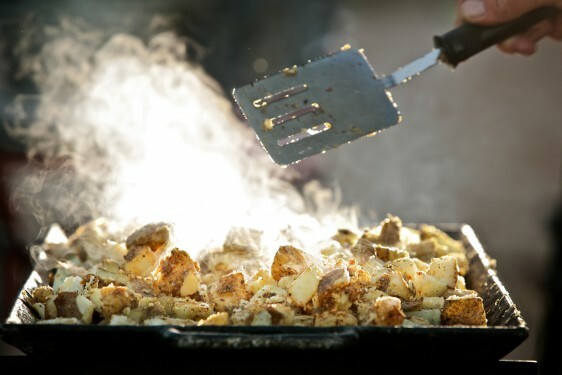 More gourmet meals laid out for your selection and convenience. Guests and guides alike have been known to get into stone-skipping competitions around this time. River and off River Time. If you’re in a designated flatwater section and of the proper age, you may be allowed to take off your life jacket, snooze, and soak up some sun (be sure to wear sunscreen!). Ask your guide if you can hop on the sticks and row for a bit! Or stop for a side canyon hike. 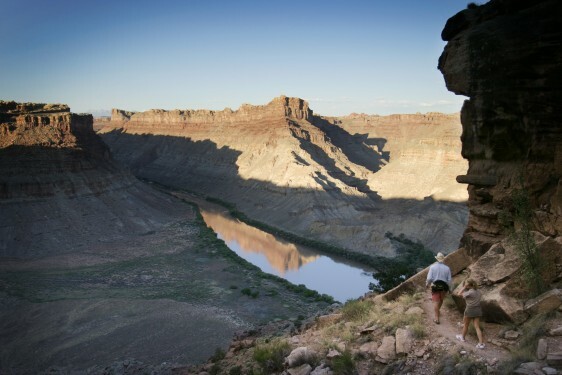 On certain rafting trips like the Colorado River through Cataract Canyon, hiking is a highlight of the trip. You are in the middle of Canyonlands National Park after all! These three elements of the end of your day can be spaced at varying intervals. Depending on how rowdy the crew is, the canyon may echo with laughter well into the night under a blanket of (occasionally shooting) stars. 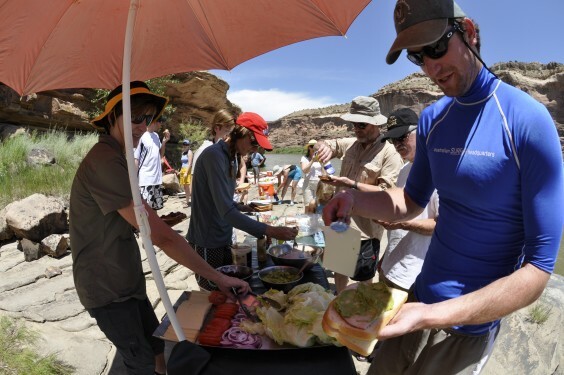 Other nights, everyone is too exhausted from conquering the rapids and a full meal- lasagna and filet mignon are known to make an appearance on our trips. There’s nothing quite like sleeping on a serene river shore, deep within the heart of the desert. Sweet dreams of shooting the whitewater rapids of the Colorado River abound. Wake up the next morning and do it all over again, and as always, Go With The Flow!